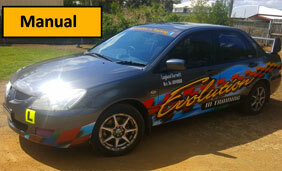 Evolution in Training is owned and run by Leyland Barnett, accredited driving instructor with over 15 years experience teaching learners in and around the Rockhampton area how to drive safe and responsible. Specialising in providing safe driver training and providing defensive driving training material. "Training is provided in a patient, friendly manner and I consider my clients needs very carefully. I believe in providing great value for money, with every lesson." Evolution in Training's goal is to teach people of all ages, how to drive safely. Training is provided using the guidelines set out by Queensland Transport's Q-Safe manual and lessons run for 1 hour. Written reports and an exclusive reference guide is provided to every student to refer to and study. You can build up your logbook hours quickly, 1 hour with us counts for 3 hours in your logbook for a maximum of 10hrs (daytime only), 10 one hour lessons will get you 30 logbook hours! I train in Rockhampton, Yeppoon using a modern, well maintained car. Trading hours are flexible to suit the students needs.